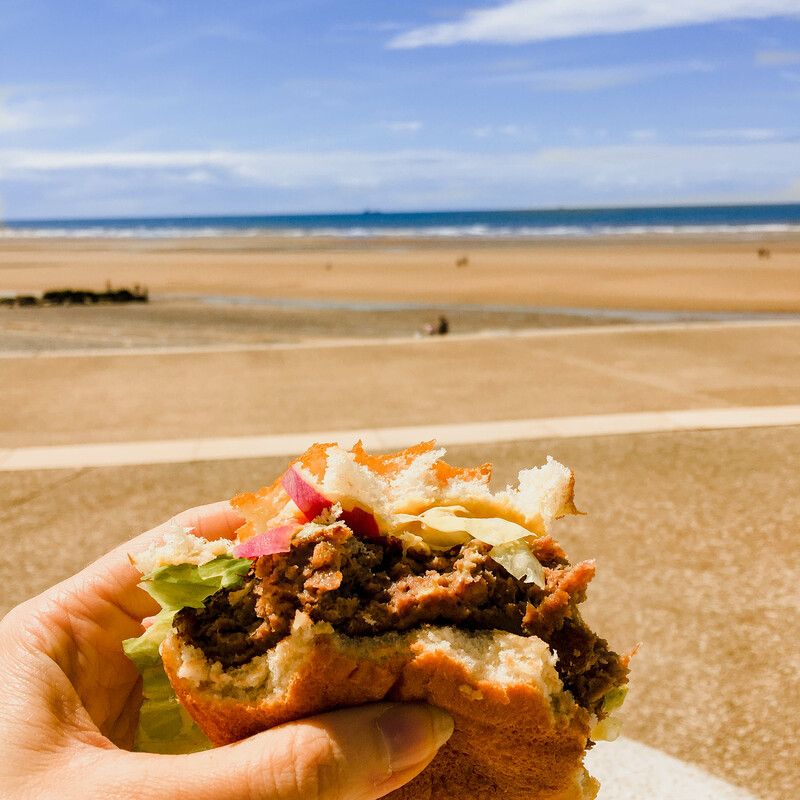 Cleveleys isn’t exactly known for its exciting cuisine, with its mixture of cafe’s, tea rooms and fish and chip shops, catering to the daytrippers and coach trips that arrive daily. However, as a local, it’s always exciting when something different arrives to “shake” (sorry, couldn’t help myself) things up a little bit. 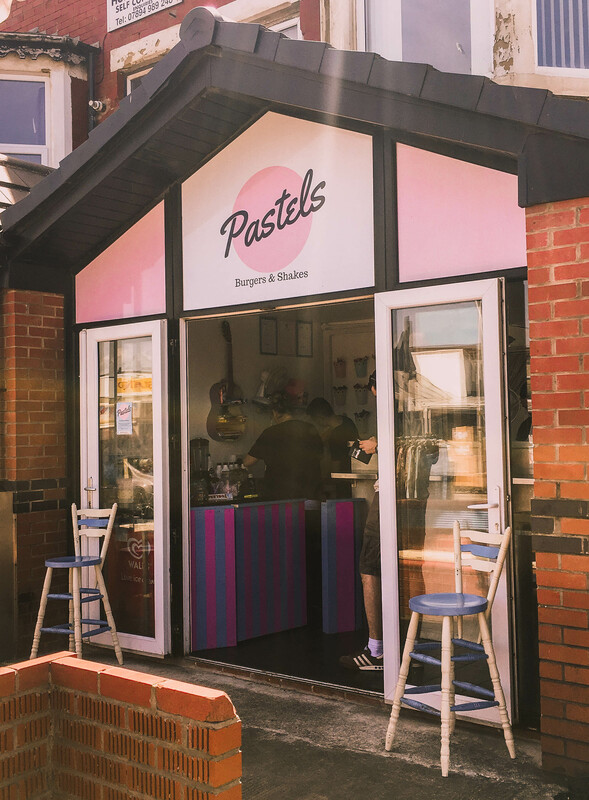 Ok so not EXACTLY a restaurant, in fact, Pastels is a fairly hidden (gem) hole in the wall located a short walk from Cleveleys Beach, blink and you might miss it. I was first alerted to its presence via their facebook page, where they share some of their wonderful creations. 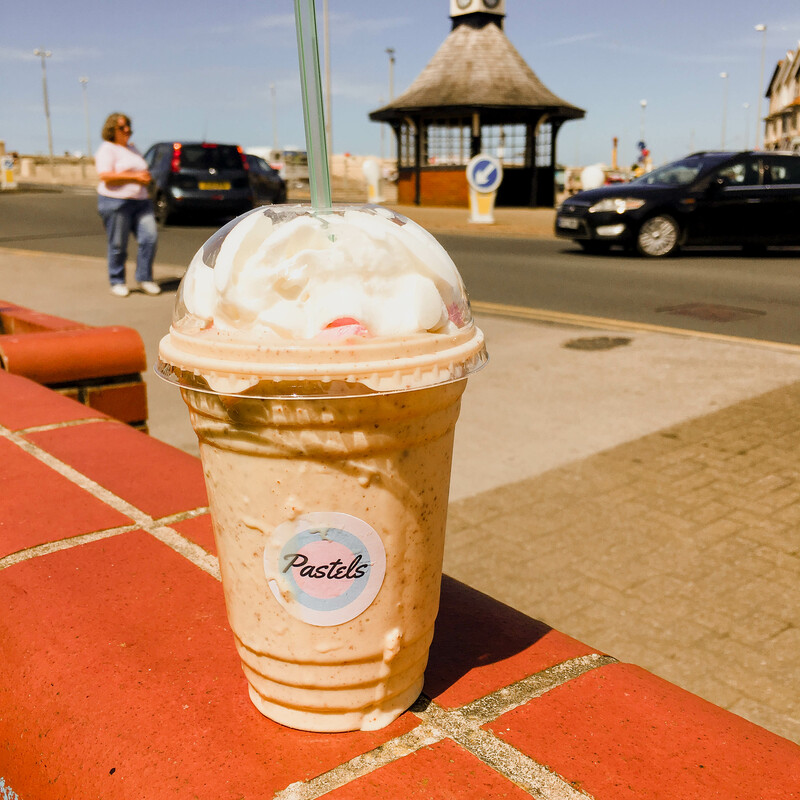 If those weren’t enough to convince us a visit was in order, the shakes certainly were! 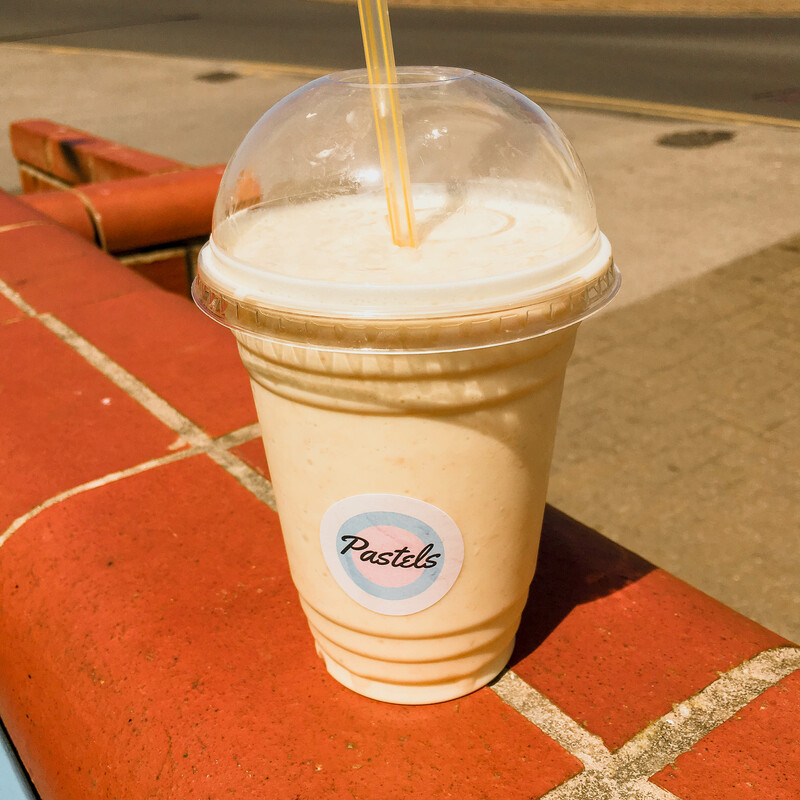 Despite saying all morning I was going to stay strong and true to my current diet regime and forgo on a shake I completely caved when I saw all the amazing options they had, you can see a few more of them on their menu as well. I mean look at the CHOICE! and at a very reasonable £3.50 you get a shake of your choice topped with optional cream AND marshmallows. Despite all the choice, they keep the burger options very basic, and I for one am a big fan of that. It’s rather “trendy” at the moment to tower up your burger with lots of themed ingredients, they certainly make for great Instagram pics but to eat? not so much, they usually end up in one big sloppy mess! We both ordered a cheeseburger with all the trimmings and a side of fries each, which along with the shake made up a meal deal. For the two of us the bill came to around £14 which we thought was very reasonable. 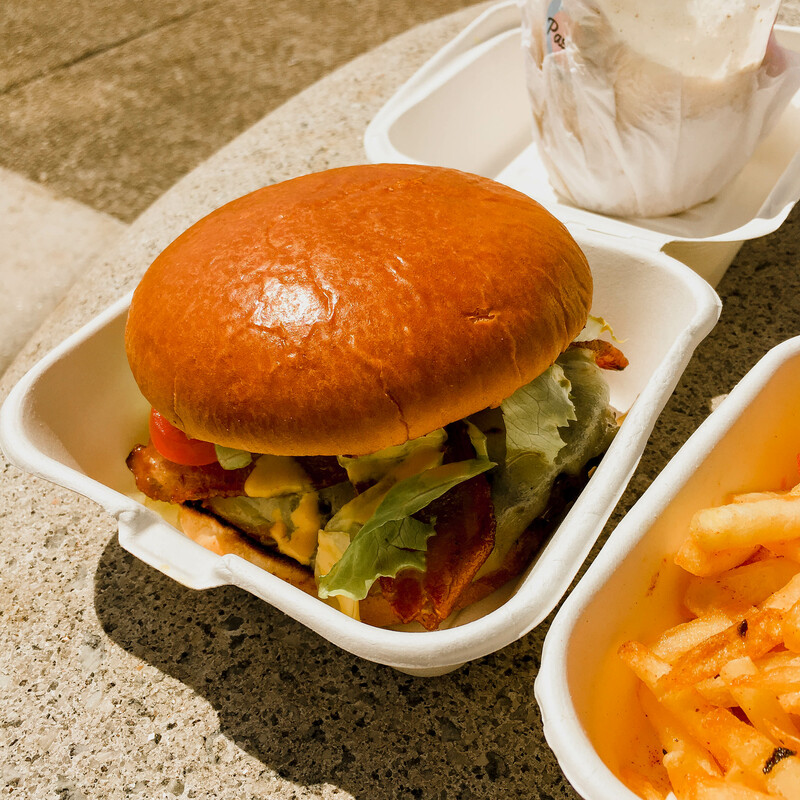 All the burgers are cooked from scratch, so be prepared for a short wait, this isn’t McDonald’s (thankfully!). My only criticism is that the shakes are made first, so by the time the burgers were done we’d finished the shakes (you can’t really wait otherwise they would melt) I would have preferred to have the shakes with my meal. As I mentioned before there isn’t really space for any seating, unless you count the bench and stools outside. But who needs that when the beach is just a short walk away. We grabbed our food and settled on a picnic table on the prom. Burgers come in a brioche style bun, with salad and burger sauce. All in all a brilliant burger, the patty was well cooked and not in the least bit fatty, and the burger sauce was amazing, I need to know where that’s from! But did it also passed the most important test, could I actually eat it? Yes and No, it was still a little messy to eat, blame that yummy burger sauce! but it didn’t go mushy or fall apart so it’s a big thumbs up from me on that score. The fries were just ok, covered with yummy red salt they were tasty but they weren’t anything special, I would probably just stick with the burger next time as it was filling enough, but as a side, they did the job. All in all a great and entertaining lunch option. They are always updating their facebook page so I can’t wait to try some of their new flavours and combinations in the future. Oh my god that looks amazing! Those burgers look so good. I wish I had one close! Omg this looks so yummy! 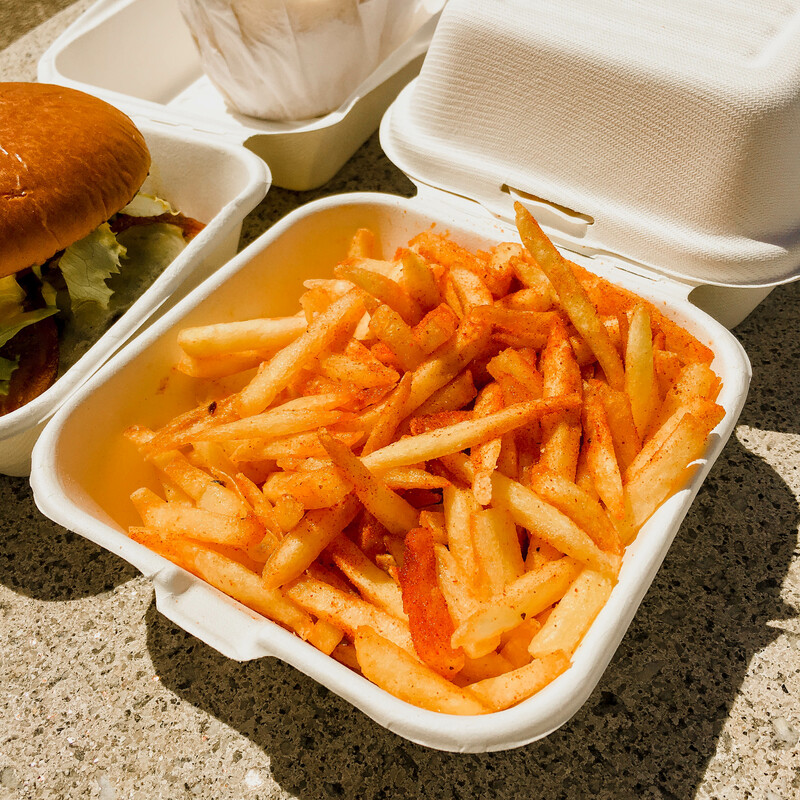 A burger and fries is literally one of my favorite meals of all time. Oh wow, that Hamburger looks delicious, and trust me I know hamburgers! Lol I am American, need I say more? That is like 1/4 of our diet 😉 ;)! Really though, for a special treat, I would get that burger any day :)! I was getting quite geared up to giving this place a go – but then you lost me at “brioche style bun”….. Unfortunately the words brioche and burger together do not fit into my food vocabulary. ah no!! they do do a bunless burger but that sounds even worse! I do like my burger in a bun – but it has to be a “proper” bread bun. As a teenager, I recall Wimpy burgers and their burger buns were always toasted – delicious! This place sounds fab! 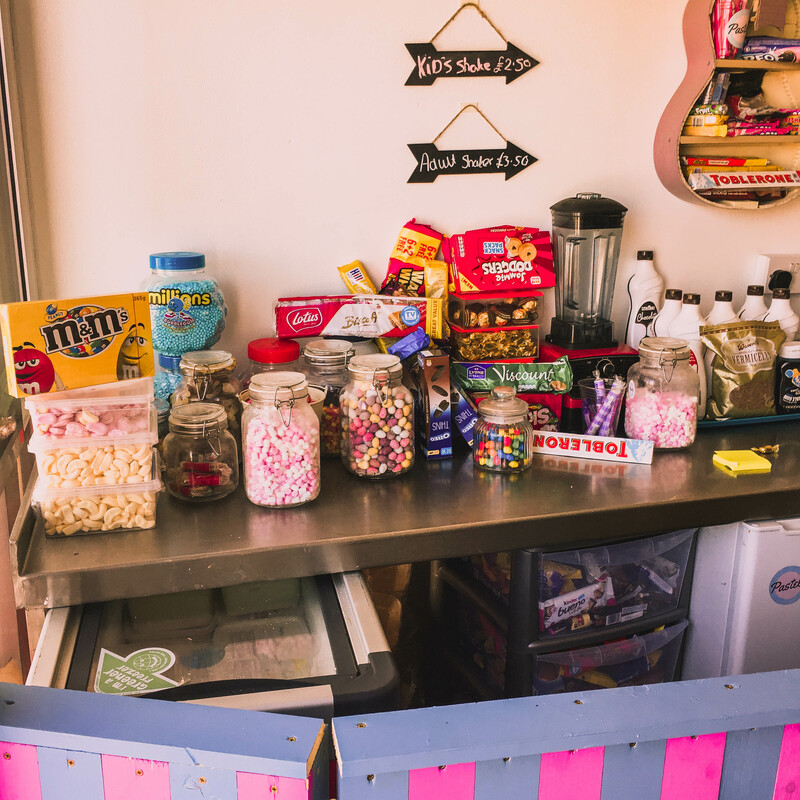 We have a milkshake bar here that does ones just like that & it’s so amazing, the combos you can make is endless! That burger sounds delicious! Oh my gosh my other half would love this place as he loves milkshakes, and I would love it for the burgers! My mouth is watering at the sight of them! I am so hungry now 🙂 Everything looks delicious and like that they offer you a big choice.to make combos. those burgers look so juicy! Definitely makes me want to check out this place. And the oreo shake would be what I would also order. Im hungry from your photos. those burgers look so juicy! Definitely makes me want to check out this place. And the oreo shake would be what I would also order. Great – now I’m hungry lol! I love how you took the different photo perspectives such as the view of the burger with water in the background! Love burgers on a brioche bun! It looks like a great little place to go too! And the snacks! Yum!! Wow, this looks like such a unique place! And I love all of the shake options. I am not a huge burger fan, but I love going to places like this just for the shake and fries!! Wow! Need to check out this place! This place is too cute and looks delicious! You’ve got me craving a burger and shake now! Ok, this place looks adorable just from the exterior. Those shakes sounds super yummy and perfect for summer! What a great place to grab lunch and enjoy outdoors! Those shakes look pretty good! Pertect for summer! OH MY GOSH! This place looks amazing!!! I could always go for a burger, fries and a shake! I am drooling over the pics of the burgers and shakes! Yum! Pastels looks so lovely. It’s so inviting and family friendly. Great! This looks so delicious!! I would love to visit there! The burger looks so yummy! WOW! This looks like such a lovely place to eat! I wouldn’t know where to start ?? ?